On the day of the vote, Ashkenazic-haredi party still hasn't reached consensus on whether to vote against the draft bill or merely abstain. On Monday, the Knesset will vote on the new Draft Law, which will extend the program of draft deferments would be extended, but with the addition of financial sanctions imposed on yeshivas whose student bodies do not meet the government’s induction goals. The bill, drawn up by Defense Minister Avigdor Liberman (Yisrael Beytenu) and the Defense Ministry, also provides extra benefits to draftees, increases punishments for draft dodgers, and expands the number of programs in the military designed specifically for the haredi community. The draft bill also requires that haredi draft levels reach at least 85% of the goal set by the government. Failure to reach the minimum number of inductees three years in a row would result in the termination of the amendment. The proposal must pass three Knesset votes in order to become law. Meanwhile, the haredi parties are still arguing amongst themselves over whether the bill should be supported, opposed, or ignored. 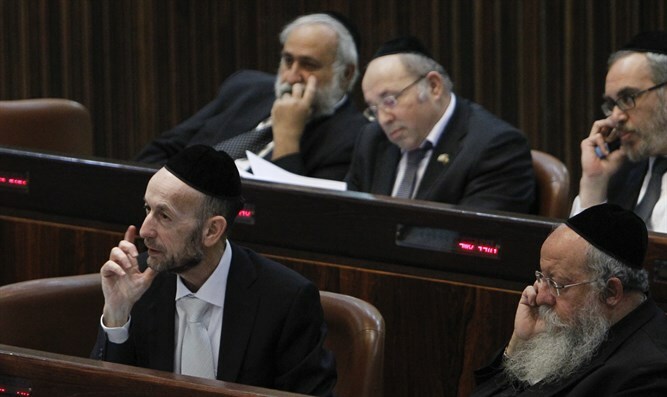 The Ashkenazic-haredi UTJ's Agudat Yisrael faction, led by Deputy Health Minister Yakov Litzman, was told by their rabbis to oppose the law, Hamodia reported. According to the Yated Ne'eman, the party's Degel Hatorah faction will simply "not support" the law in its present format. The Sephardic-haredi Shas party has declared that the law is "the least of the bad" and that they will not oppose it. However, Sephardic rabbis on Sunday prayed at the grave of former Sephardic Chief Rabbi Ovadia Yosef that the law should not pass. It is not clear whether the haredim will simply abstain from voting or vote in opposition. Kikar Hashabbat quoted unnamed haredi sources as saying that "the best situation is that the law, which is the best of the evils, will pass the vote today in the Knesset, supported by Yesh Atid and with the Arab parties' abstention. We will vote against it, and we will amend the law in the committee which will be appointed prior to the law's second and third Knesset votes."